By 1926, the frenzied Roaring Twenties was in a full-throated roar. God was in His heaven, Calvin Coolidge was in the White House, and all seemed well with the world. Personal income was on the rise, new consumer goods were pouring into the marketplace, and Americans had been given a painless new way to pay for all those flovvers and Frigidaires. It was called the installment plan. "The business of America is business" was the way Coolidge had put it just a year earlier, in a speech to the American Society of Newspaper Editors. "Silent Cal" seemed to have a point: Wall Street was actually running America's show, and the nation appeared to be flourishing. Few foresaw the financial disaster that loomed only three years down the line. Amid the self-indulgence and the widespread preoccupation with material possessions, Americans took time in 1926 for a "party" with deeper significance: July 4, 1926 marked the sesquicentennial, or 150th anniversary, of the Declaration of Independence. This milestone inspired a national celebration which included the production of two special coins by the U.S. Mint. The Declaration's centennial in 1876 had led to the staging of a lavish exposition in Philadelphia. 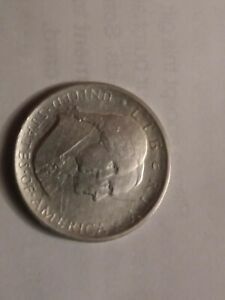 No special U.S. coins had been issued then, however, for at that time Uncle Sam wasn't making commemorative coinage; the practice didn't start until 1892. By the mid-1920s, the U.S. Mint had issued more than a dozen commemoratives, and it was a foregone conclusion that new ones would join the list for the nation's 150th birthday party. Initially, in fact, the National Sesquicentennial Exhibition Association envisioned a whole series of coins with designs portraying highlights from throughout U.S. history, but that ambitious concept never got past the talking stage. The original legislation did call for production of a $1.50 gold piece, a denomination not issued before or since, but that too ended up on the cutting-room floor. 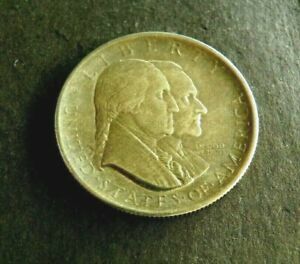 The bill passed by Congress on March 3, 1925, authorized the striking of up to one million silver half dollars and up to 200,000 gold quarter eagles. 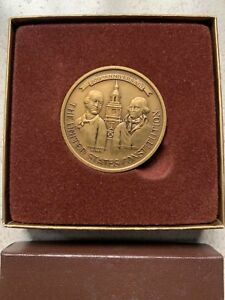 These were to be provided at face value to the Sesquicentennial Exhibition Association for sale in conjunction with the national observance of the occasion, which again would feature a fair in Philadelphia. 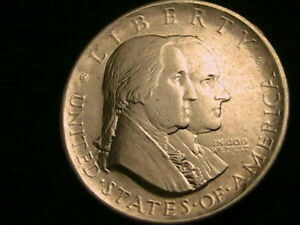 Design of the coins was entrusted to John Ray Sinnock, chief sculptor-engraver at the main U.S. mint in Philadelphia. His artwork for the quarter eagle won quick approval; a standing figure of Liberty dominates its obverse, while Independence Hall graces its reverse. His half dollar sketches encountered opposition, though. The Exhibition Association deemed them unsatisfactory and turned instead to sketches by John Frederick Lewis, a prominent local patron of the arts, sending these to Sinnock for translation into models for the coin. The chief engraver followed the group's instructions, but he then displayed dubious integrity by tacitly accepting full artistic credit for the coin. Only decades later did Lewis' role receive proper recognition. 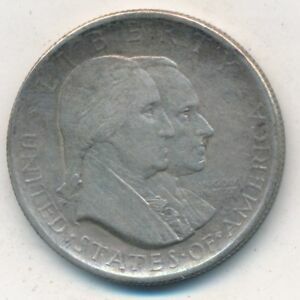 The half dollar's obverse features overlapping right-facing busts of George Washington, the nation's first president, and Calvin Coolidge, the White House's occupant at the time of the sesquicentennial. This pairing has a certain symmetry and logic, but a strong case could be made that Thomas Jefferson - the Declaration's chief author - would have been a more fitting choice than Washington. 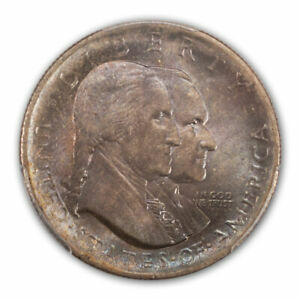 Even stronger objections could be raised (and were indeed raised at the time) to Coolidge's portrayal, since U.S. coinage tradition (fostered by Washington himself) frowns upon the use of living persons' likenesses on our coins. 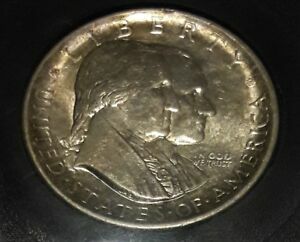 It's true that the 1921 Alabama Centennial half dollar had broken with this custom by depicting that state's governor, Thomas Kilby, thereby establishing a precedent for Coolidge's appearance, but many, then and now, have viewed this as a case of two wrongs not making a right. 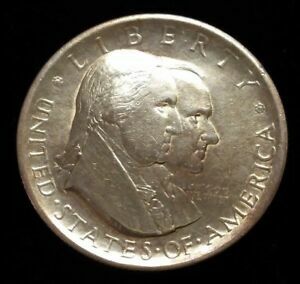 The presidential portraits are surrounded by a series of coinage mottos: LIBERTY above the portraits, UNITED STATES OF AMERICA below them and IN GOD WE TRUST in minuscule letters to their right. 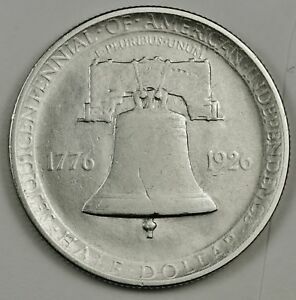 The coin's reverse features a straightforward view of the Liberty Bell, with the dual dates 1776 and 1926 to the left and right, respectively. Above the bell is the motto E PLURIBUS UNUM. 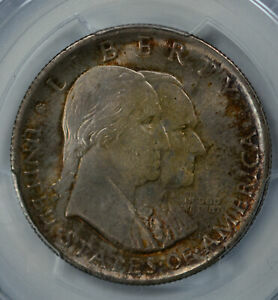 Circling the rim, within an interior border, are the inscriptions SESQUICENTENNIAL OF AMERICAN INDEPENDENCE and HALF DOLLAR. 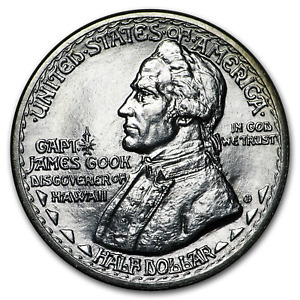 This reverse would reappear, in modified form, 22 years later on the Franklin half dollar, again with sole design credit being given to Sinnock. Here, too, Lewis would receive his due only belatedly. For reasons best known to itself, the sponsoring organization insisted on extremely shallow relief for the sesquicentennial coins. 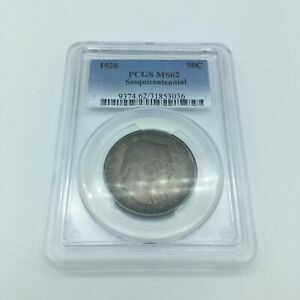 As a result, they struck up very poorly; indeed, they may be more weakly struck as a group than any other coins in U.S. history. 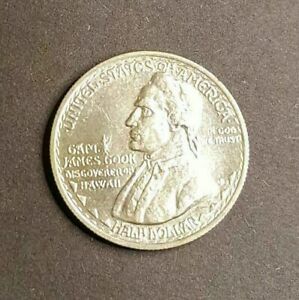 Strongly defined examples are all but unknown, and even well-preserved uncirculated pieces generally lack detail and appear to be flat and grainy. To make matters worse, many of these coins have been cleaned and/or polished over the years, perhaps in an effort to improve their lackluster looks. 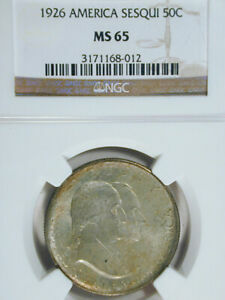 Readily available in AU to Mint State 60, few have been certified above Mint State 64 and almost none above MS 65. 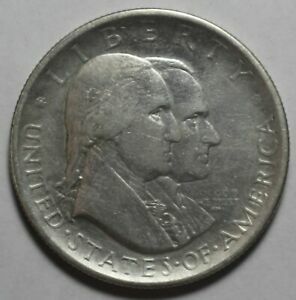 The first places to show wear on the coins are Washington's cheekbone and the lower part of the bell; technically speaking, these are the highest points of the design. The coins' unattractive appearance undoubtedly hurt their sales. Then, too, the Sesquicentennial Exposition, held in Philadelphia from June 1 through November 30, 1926, fell far short of the sponsors' expectations, even though six million people did pass through its gates. 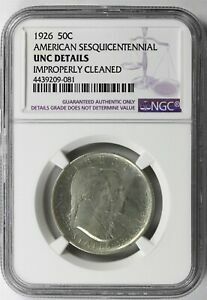 In any case, relatively few fair-goers chose to pay the going price of $1 apiece for the half dollars and $4 each for the quarter eagles, and huge quantities ended up being melted. 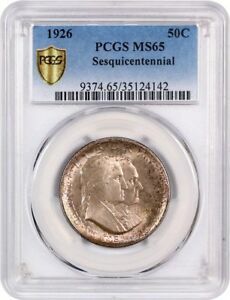 Of the 1,000,528 half dollars (528 of them assay coins) struck at the Philadelphia Mint in May and June of 1926, 859,408 were returned there later for melting, resulting in a "net" mintage of 140,592 pieces. 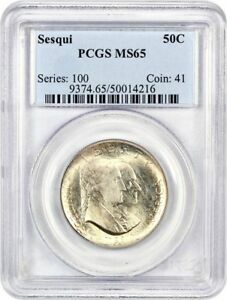 Proofs of the "sesqui" coins were not officially struck, but the late Walter Breen, a renowned numismatic scholar, reported the existence of at least three matte proof half dollars, adding that a fourth was rumored to exist as well. 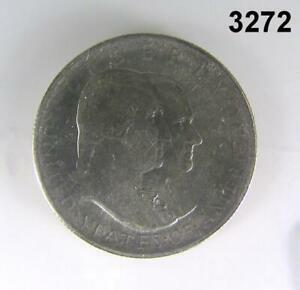 Besides being sold at the fair, the coins were also distributed by the Franklin Trust Company of Philadelphia. The original packaging used by the bank consisted of an envelope with the blue-imprint "Official SesquiCentennial Coins," along with a small commercial message: "At Your Service Day and Night." The American Independence Sesquicentennial half dollar and quarter eagle may not be the most aesthetically appealing coins, but they hold a place of honor in U.S. coinage history just the same. Numismatic scholar Don Taxay made this point in his Illustrated History of U.S. Commemorative Coinage. 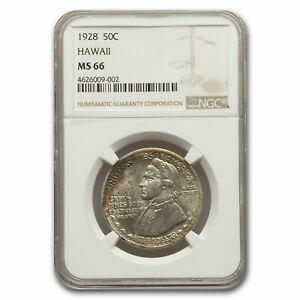 These, he wrote, "are, historically speaking, our most important [coinage] memorial issues."